For those who missed part 1 in the season rewind you can find it here. Party in Muncie! Your Cardinals won 6 games in 2011. Just when everyone had Ball State out your Cardinals went on the road and beat a division champion. I was away from technology that weekend and asked a friend to check the score on his phone. When it said Ball State won 23-20 I thought it was a mistake. It was true. The defense won the game forcing three turnovers. Safety Joshua Howard had a pick and fumble recovery and good for him. He had been in Sean Baker’s shadow for three seasons so it was great to see him able to run the show when No. 25 was injured. Both safeties should be on NFL rosters this fall. Super 8 is a great movie but I cannot name a single actor in the film. That’s similar to Ohio game. The game was collective effort of small and medium-sized plays that added up to a big victory. Ball State came out flat in this game and trailed 17-3 at the half. The few fans who were there thought it was Temple all over again and the Ohio win must have been a fluke. This game probably displayed Pete Lembo’s coaching ability best as his halftime adjustments worked perfectly. Ball State scored 21 points in the third and held on for the win. The fact that Ball State is inconsistent is not a big concern right now. Keith Wenning is still learning the quarterback position as he did not play it much in high school. If the second half team shows up more in 2012 and 2013 we may be looking at MAC championship in Muncie. Maybe an undefeated season, top 15 ranking and a bowl game against Tulsa in Alabama. What? Too soon? Lembo showed coaching brilliance against Central Michigan but Western was probably his most questionable game. Ball State went for it on fourth down four times and only converted once. The three failures occurred in field goal range and swung momentum to the Broncos each time. I like the gun-slinger mentality Lembo brings to the table but you can win every gun fight. There is a fine line between aggressiveness and recklessness and the Cardinals probably crossed it in Kalamazoo. On a side note I watched this game online and was amazed at how the Bronco commentators complained about the low attendance of about 16,000 fans. At Ball State, 16,000 fans is huge a crowd. At Western Michigan it is a slow week. Just another example of how much the program needs to grow. Thank God for Eastern Michigan. The Eagles had more yards, more first downs, double the time of possession, won the turnover battle but still found a way to lose. Ball State played well enough to win but Eastern Michigan gave this game away with 12 penalties and poor play calling in the red zone. Thanks for the help Eastern! Then again Ball State gave away the 2010 meeting in Muncie so I guess we are even now. The defensive highlight of the year occurred in the last two minutes of this game as Ball State forced Eastern to kick a field goal after having first and goal inside the one. If the Eagles punch it in the Cardinals probably would not have won and ended up an unsatisfying 5-7. Statistically, Ball State had one of the weakest defenses in the MAC but stats fail to take into account coming up big in key moments like this one. We found out that Ball State is the Ryan Reynolds in the MAC in this game. Good enough to get roles but not good enough to be the first banana of successful blockbuster (Green Lantern certainly was not). Sure, officiating was questionable, but Ball State had their shot to slay the alpha dog of the conference on the road. The offense stalled in the fourth quarter and the defense could not get stops. The game was primetime on ESPNU on a night where the NBA was still dealing with lawyers. The Cardinals had a chance to grab the lead role but they are not there yet. 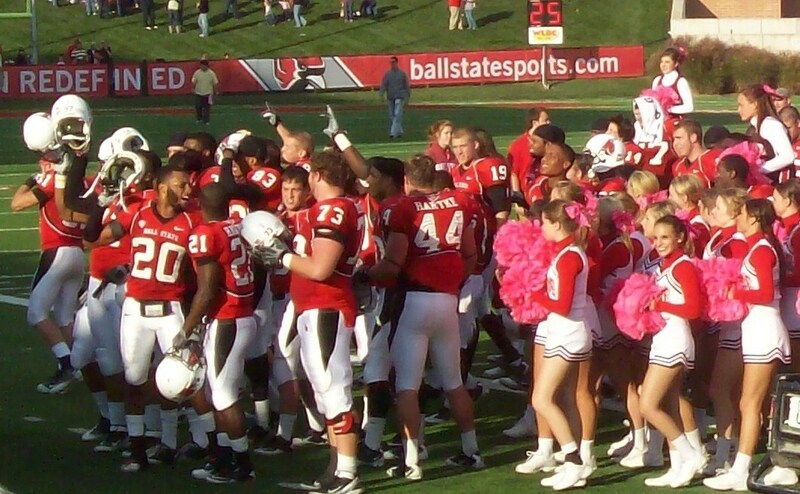 In the future Ball State will be the star of the MAC like it was in 2008. The fact the Cardinals had a chance to claim glory in Lembo’s first season is a credit to his staff and players, but it is hard to jump from 4-8 to the MAC Championship game in one year. Ball State was good enough to be respectable in the 2011 season and Cardinals fans could not say that a year ago. I thought Green Hornet was going to be a good movie much like I thought Toledo would be a good game. Then I saw Seth Rogan in the lead role and I just knew it was a waste of time. I had the same reaction watching Toledo’s stud wide receiver Eric Page zigzag through the Ball State secondary. The game could not end fast enough. I kept thinking “If Ball State keeps it close then maybe they get a bowl invite at 6-6.” With each Toledo score the odds became smaller and smaller to eventually none. Watching the fourth quarter online (I think I know one student who actually went) felt more like a funeral. The 2011 season was over. Note to the MAC, NO MORE BLACK FRIDAY GAMES! Another year without a bowl game for Ball State. I am proud of what Ball State accomplished. The wins over IU and Army were satisfying enough for me even if Ball State lost the rest of their games. There are reasons to be optimistic as well as reasons to be concerned next season. Just like every other team. Think of it this way. It is currently better to be a Ball State football fan than a Penn State and Indiana football fan. Never thought I would be able to say that year ago. Not bad as we go into the thick of basketball season.